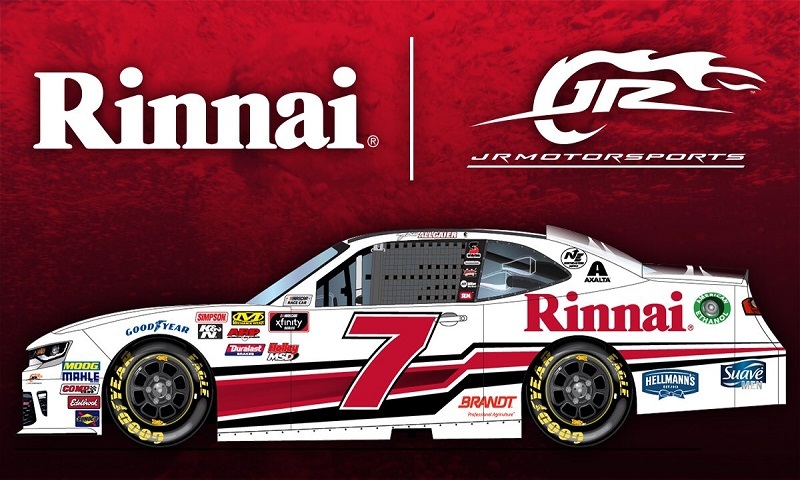 Justin Allgaier will carry the colors of Rinnai at Atlanta Motor Speedway later this month. MOORESVILLE, N.C. – JR Motorsports has announced that the Rinnai Corporation will serve as the primary sponsor of Justin Allgaier’s No. 7 Chevrolet for the NASCAR XFINITY Series Rinnai 250 at Atlanta Motor Speedway on Feb. 24. Rinnai has been a long-time partner in the sport, with its involvement spanning more than a decade, and increased its involvement last year after signing on as a multi-year sponsor of the Atlanta XFINITY race. Headquartered in Peachtree City, Georgia, Rinnai America Corporation is a subsidiary of Rinnai Corporation, based out of Nagoyoa, Japan. In addition to water heaters, Rinnai also manufactures gas appliances, including a wide range of kitchen equipment and heating and air-conditioning units. Rinnai recently announced plans to build its first North American manufacturing facility in Griffin, Georgia. The company intends to start its manufacturing and assembly operations in an existing factory in Griffin in April, before moving those operations to a new facility that Rinnai will construct. Allgaier is in his third year with JR Motorsports and is coming off the first multi-win season of his XFINITY Series career. In 240 series starts, he has five wins, 52 top-fives and 128 top-10 finishes.